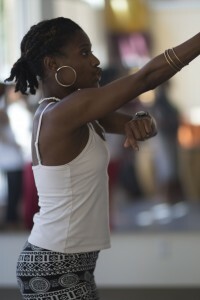 Berry's student imitates cradling the shell of a snail believed to be representative of the Creator as a part of the spirit of Afro Cuban dance. Drummers provide a rhythm to accompany Berry's dance classes. 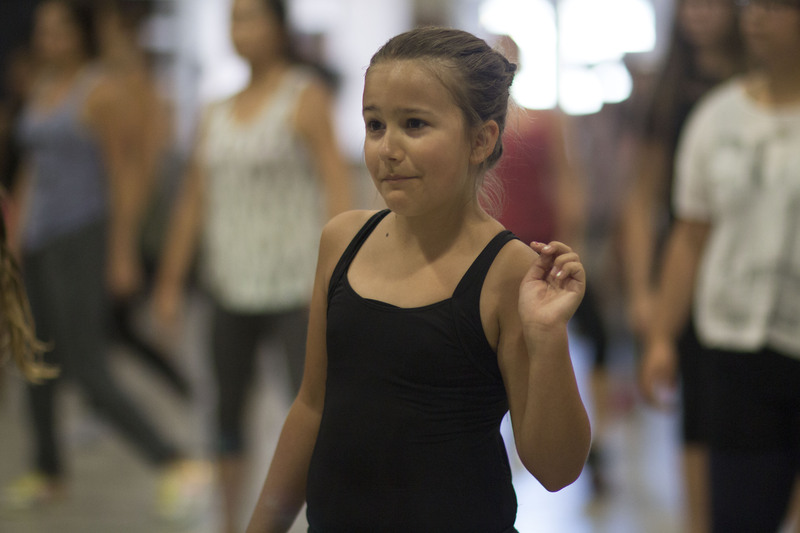 On Saturday, July 25th, National Dance Day was celebrated at Ballet Austin with students of all ages learning the same choreography by the Dizzy Feet Foundation as people from all over the country. Kaylyn Fenner, 25, a Ballet Austin student participates in celebrating National Dance Day. Ballet Austin provides dance programs ranging from Beginning Ballet for Adults to Latin Jazz. 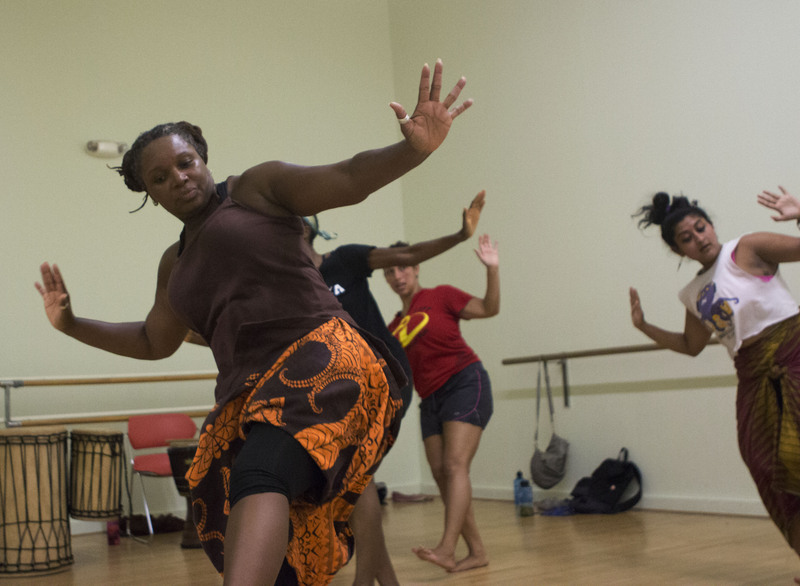 Tonya Pennie's West African dance class rehearses for an upcoming production at Lannaya Drum & Dance. 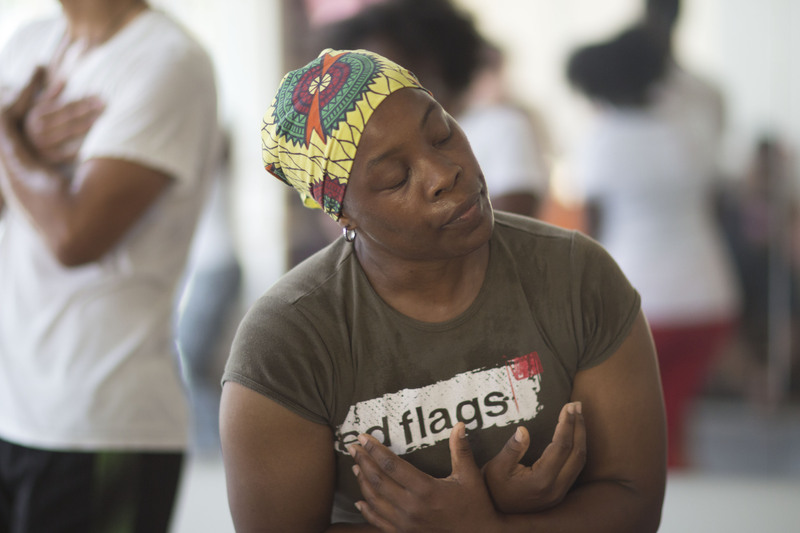 Maya Berry leads her Orisha class which uses moves that symbolize Afro-Cuban culture and legends. Jamie Vellejo dons her "lapa" which is the traditional West African wrap skirt for dancing. Compared to other major cities in Texas and across the nation, Austin’s dance community is not as broad and far-reaching. There are under twenty major dance companies in Austin as opposed to New York City, which boasts hundreds of companies and studios ranging from ballet to hip-hop to various forms of African dance. 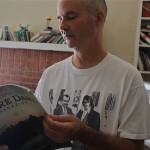 Although Austin’s dance community is small, the people who teach and participate in performances and classes are providing a much-needed influx of vitality and enthusiasm to the community in major ways and redefining the public’s perception of dance in a more personal and experiential way. Up until recent years, when people thought of dance, the first image that would pop into their minds would be that of a ballet dancer. 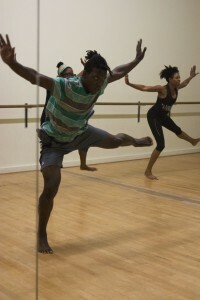 While ballet is known for its cultural significance in western culture, there are various forms of dance, like Orisha and Rumba, dance forms that have indigenous roots in western Africa, that have been around for much longer and are only recently being discovered and practiced by people on a wider scale. 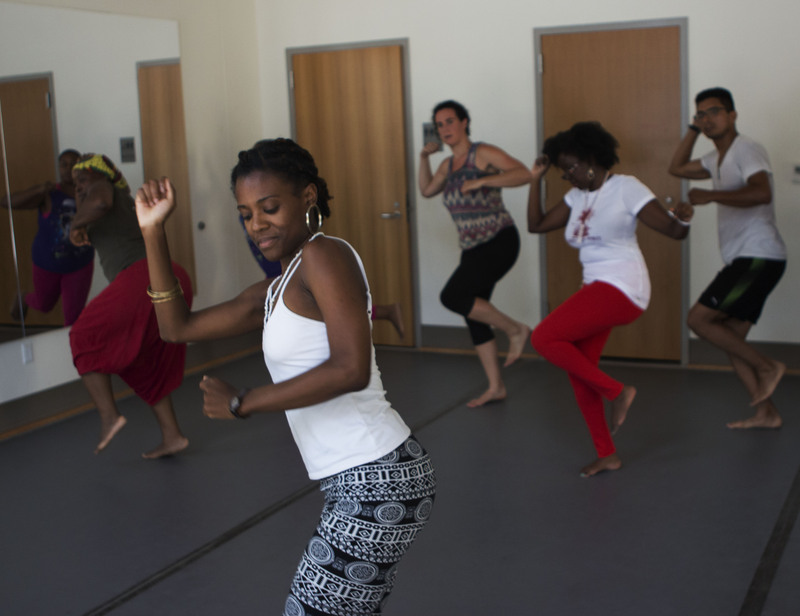 Maya Berry, a classically trained ballet dancer from New York, who studied ballet in the city as well as abroad in Europe, now teaches an Afro-Cuban dance class in the African-American Heritage Center right next door to Franklin’s Barbecue on 11th street in East Austin. Seeking a more accepting atmosphere, Maya returned to New York City, where she began studying with the Alvin Ailey Dance Theater, a historically black dance company and school formed by Alvin Ailey, one of the major pioneers of modern dance, who was born in Texas. Maya went on to be a part of several other contemporary dance companies in New York, but soon realized, “I did not like the dance business. I loved dancing, but I didn’t like the business.” Maya went back to school to study the connection between anthropology and dance, and in 2005, decided to focus on Afro-Cuban dance. Although African Diasporic dance is very different from classical ballet, Maya has brought one major thing from her past to her present: discipline. That work ethic is required in most forms of dance and the people who practice it all have another essential ingredient in common, an intense love for dance. In addition to teaching a house dance class at Ballet Austin, Jason Vaughn also expresses his love of the sport by dancing in Pennie’s West African class. Dance today as opposed to dance as it has been known in the past has shifted towards a need for a deeper understanding of the art. Knowing the history and various interpretations of indigenous dance forms, to realizing that dance can be a spiritual connector to the deepest part of your soul are ways of thinking about dance that are becoming more prevalent in today’s art world. 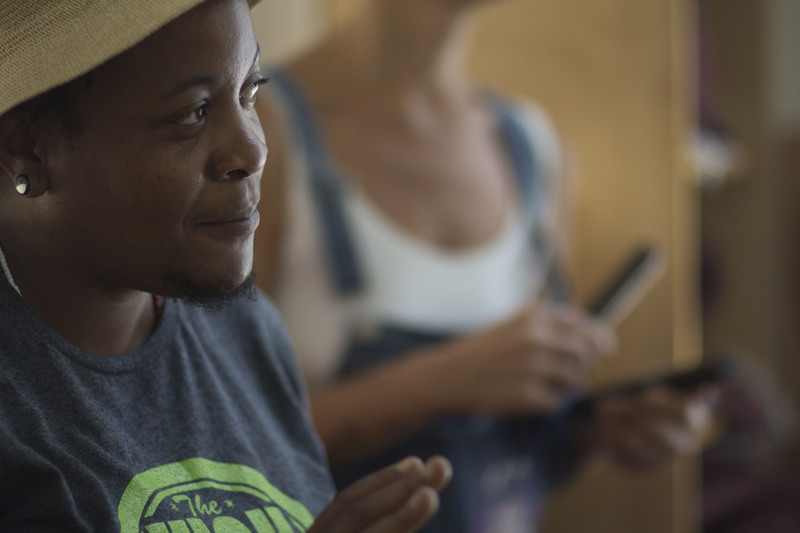 The ability of dance to bring communities together is apparent in the small but bustling dance community in Austin. People of all walks of life and from all over the world are now represented in Austin and are infusing their love and commitment to the art form in companies and schools from Ballet Austin to Lannaya Drum & Dance bringing previously little-known dance forms to the spotlight. 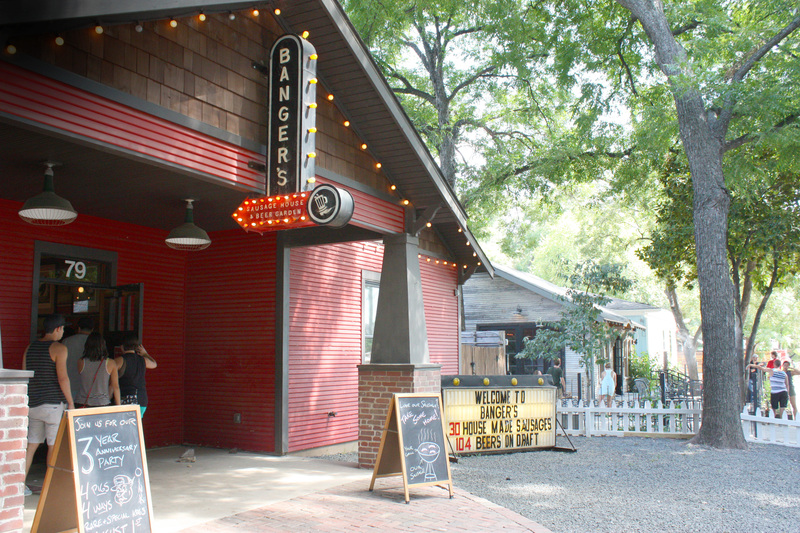 If they haven’t already ventured to Rainey for a bite at Banger’s, passersby are flagged down by the blinking marquees boasting 30 house made sausages and 104 beers on tap. It’s a hot, lazy summer Sunday in Austin, Texas. 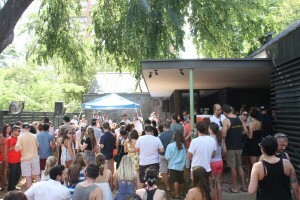 People are waking up from their Saturday activities and have begun to venture to the popular Rainey Street for brunch. The streets have long since been awake with bustling exercise aficionados that help keep Austin as one of the most active cities in the U.S. However, don’t think that outdoor recreation is limited to exercise. Eating and drinking can be just as difficult in the Texas swelter. Young professionals dress in their best Sunday Funday attire keeping in mind the increasing heat of the day. The canopy of trees that line the street offer some shade as do the growing shadows of Rainey’s soon-to-be high rises. Even with the increasing popularity of Rainey, myths of the historic street closing had begun to circle. “All of my friends and I thought Rainey was closing eventually… We assumed it was closing because of all of the high rises, I thought that was pretty common knowledge. I’m so happy we were wrong. 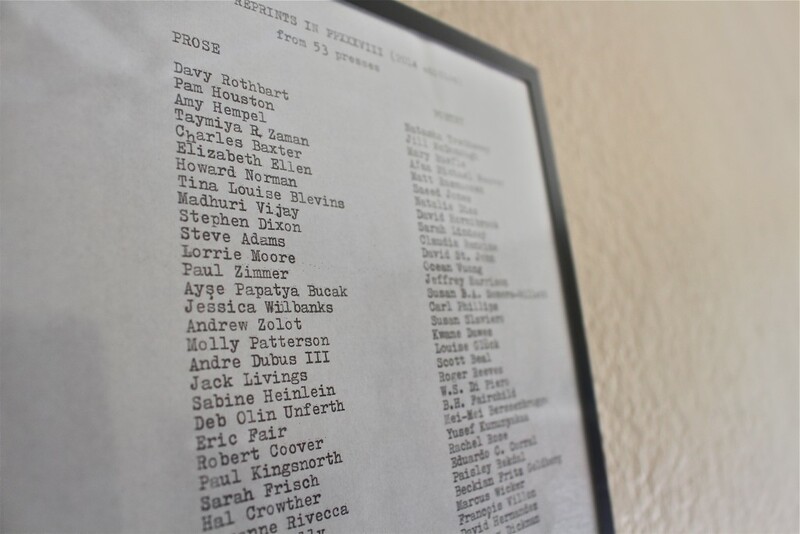 We really didn’t know what we’d do if it closed,” said recent UT graduate Sloane Schaumburger. As crowds seem to grow larger each week and as the rise of the population continues, one thing is certain – Rainey Street is here to stay. 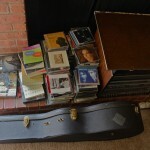 Being that Austin is the live music capital of the world, businesses tend to ensure that they uphold that expectation. A Rainey Street example is Super Soul Sundays at Icenhauer’s, every Sunday 3-6 p.m, where Austinites turn out to join in on this generation’s “Sunday Funday” culture. 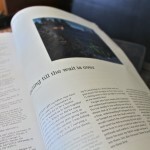 “There’s been a lot of growth and I think it’s going to continue. And I think people are excited about it and that’s why a lot of people are moving there,” said Doug Kissner, a board member of the Rainey Neighbor Association. 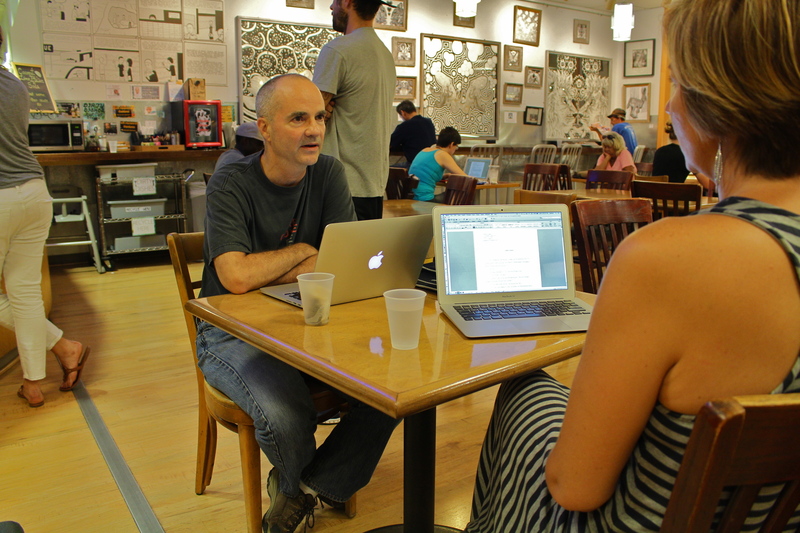 Austin was the fasted growing city among those with a population larger than 500,000. The city grew by 15.5 percent from 2010 to 2014, according to the United States Census Bureau. 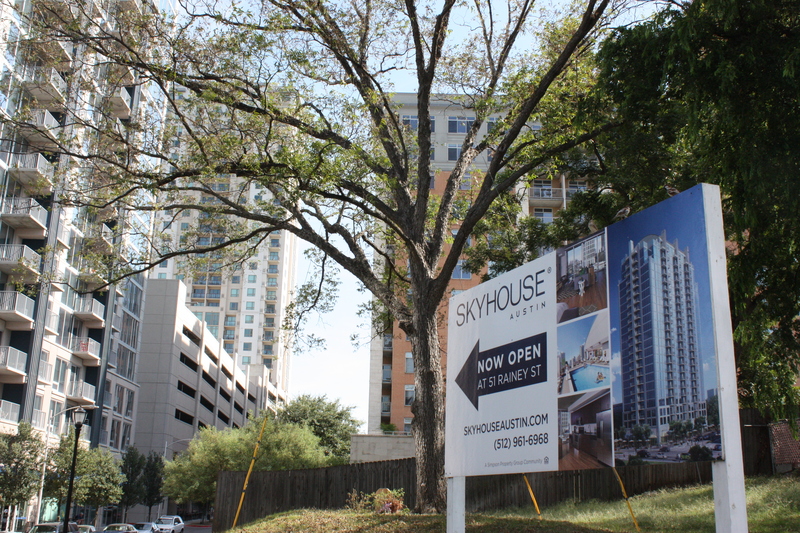 Plans for Rainey Street include the building of new apartment complexes, Skyhouse Austin, Millenium Rainey, North Shore Lofts and 70 Rainey Tower. Other buildings include the Waller Center and hotels such as Fairmont Austin and Hotel Van Zandt. To prepare for this explosion of people and already vibrant atmosphere, one Rainey Street bar, Banger’s Sausage House and Beer Garden, is expanding. They are, “…hoping to be able to serve somewhere between five to six hundred patrons at any given time,” said owner and operator, Ben Siegel. 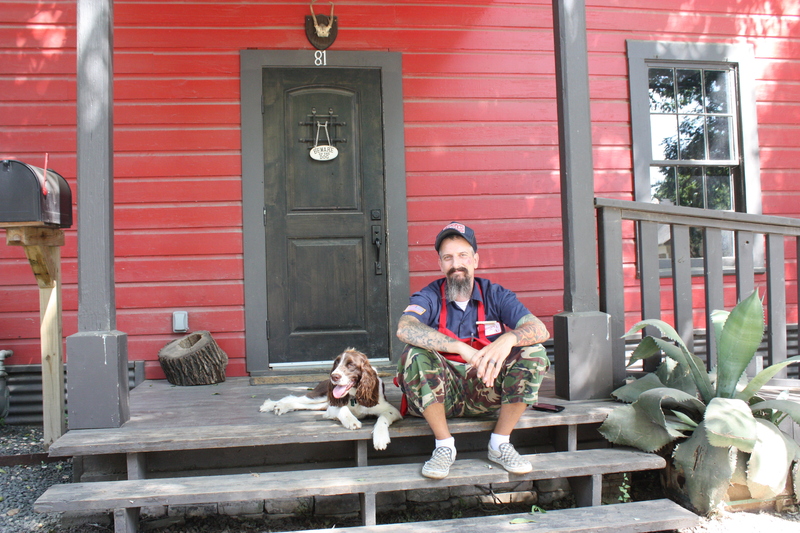 Rick McMinn, the grandfather of Rainey Street and owner of Image General Contracting is responsible for building the “house-like party” atmosphere. His company has helped preserve the street for the historic committee while leaving the façade alone. Austinites expect a motley crew of unique employees at local establishments, and Banger’s is no different. Seated in front of the company office, head chef Ted Prater enjoys a break with his dog Lulu. Along with preservation, Lustre Pearl, the first bar on the street has gone in for a makeover. Jesse Lunsford, a property developer and Co-Founder of Rainey Ventures has literally picked up the bar, put it on the back of a truck and moved it to it’s new location on 3000 E. Cesar Chavez to be transformed into a restaurant. It is set to open in October of 2015. Another similar, but not the original, Lustre Pearl will be filling in the lot space where the original used to be. The crowds begin to dwindle as the sun sets. The shadows are now larger on the street and the construction signs shadows begin to look like people. Bar signs still blink, giving light to the those remaining. People who have come from all over the world drunkenly order an Uber, Lyft, good ole taxi or get into a friends car and not blink at what they have just experienced. 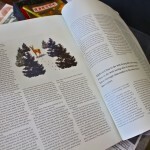 “There’s nothing like this in you know Minnesota, and New York, and wherever it may be that they are, this is Austin. And I really believe that it is Austin,” said Siegel. They have experienced Austin at its finest. 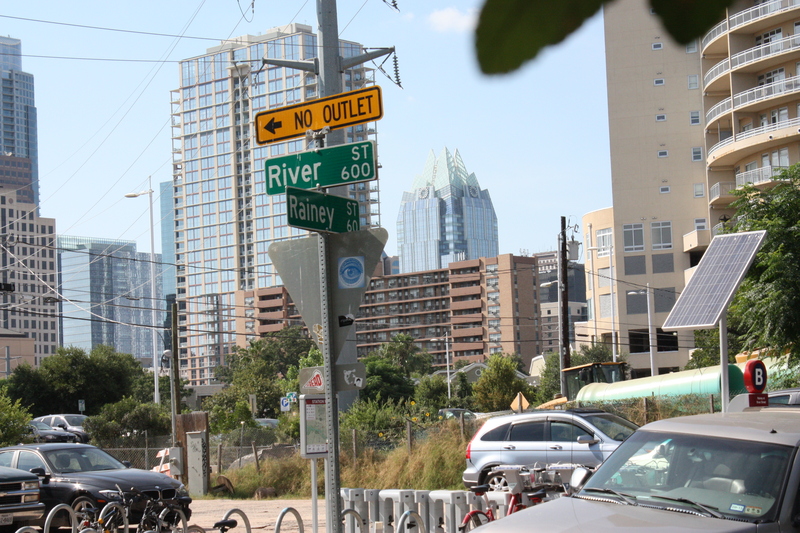 Nestled closer to sea level in the heart of Austin downtown, Rainey Street has its own pulse. 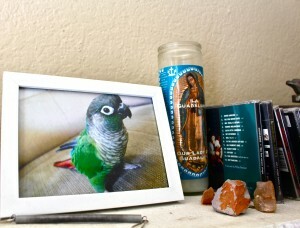 A pulse, curiously, marked by the unusual aesthetic of house parties in the shadow of high rises. 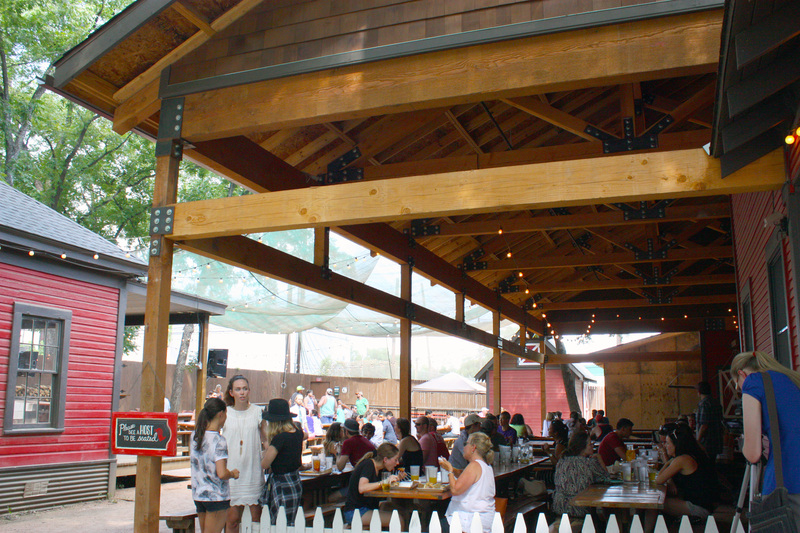 Sheltered under hulking wooden beams and a dreamy lit canopy, patrons soak up the Rainey Street atmosphere at Austin’s Banger’s Sausage House and Beer Garden. 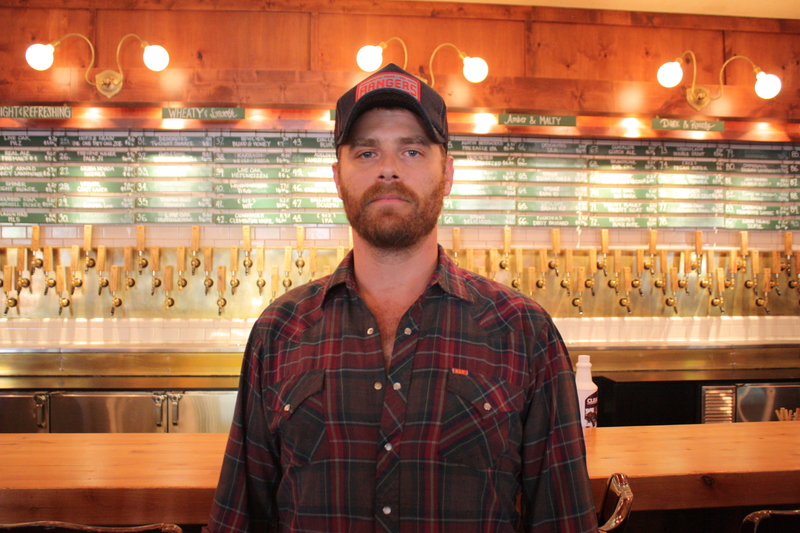 Banger’s owner-operator Ben Siegel stands proudly in front of said 104 beers on tap. Incidentally, a whopping 99 were recently switched to brand new beers for their “4 Pigs-4 Ways” anniversary party and beer festival on August 1st, celebrating three years. 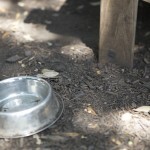 As a popular pet friendly hangout in Austin, Banger’s provides water bowls for all canine guests and even has a playpen in the yard. 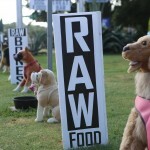 Mega Mutt Mondays are frequently held, complete with local vendors and live music. 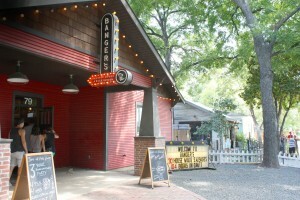 Originally built to seat around 200 guests, Banger’s now seats almost 400. Prominent Rainey Street builder Image General Contracting is expanding the kitchen, making the restaurant able to accommodate its guests even at times of highest traffic. A juxtaposition from 6th Street bouncers, it is common to find friendly Rainey Street bouncers chatting with each other and people in line. 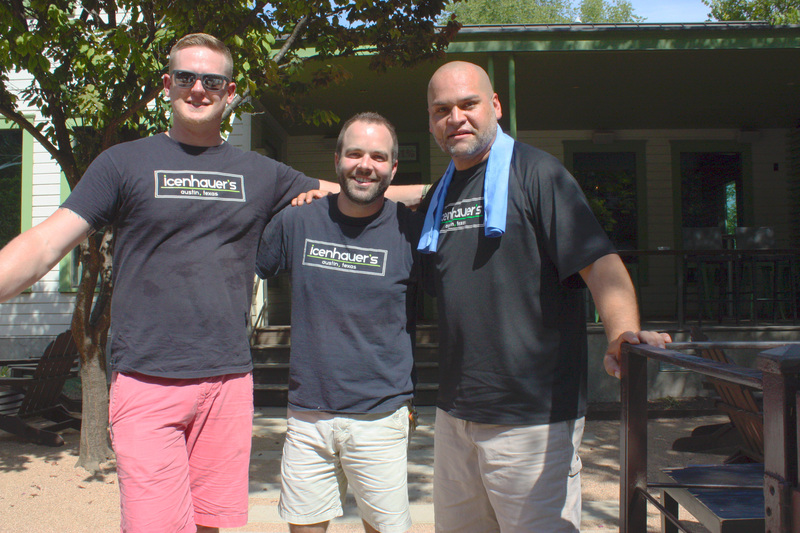 Icenhauer’s General Manager Stuart Thompson (middle) bears the July heat with fellow employees Brian and Gus. 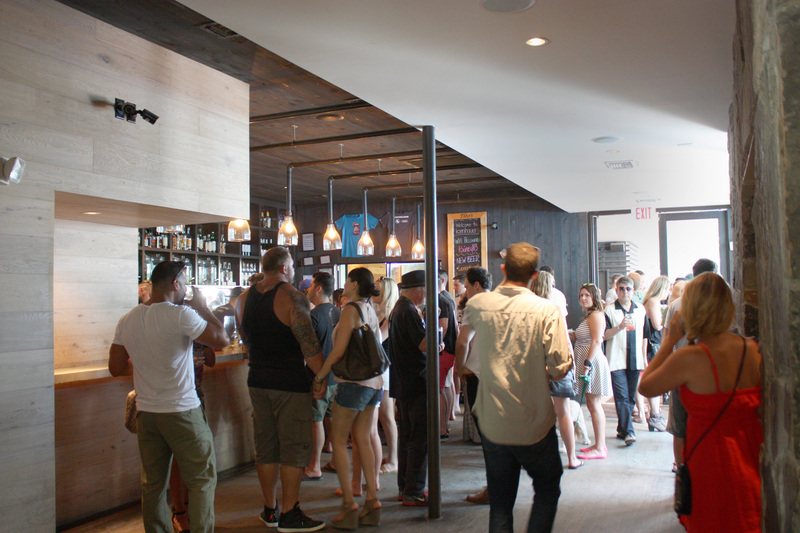 Young Austin professionals are a primary Rainey street demographic, and for them, daytime drinking means it’s the weekend. The refreshing wash of sunlight into the houses-turned-bars is one of the things that makes Rainey Street so attractive. Do an about-face at the end of the street, and it’s impossible not to catch an eyeful of the Rainey Street high rises. 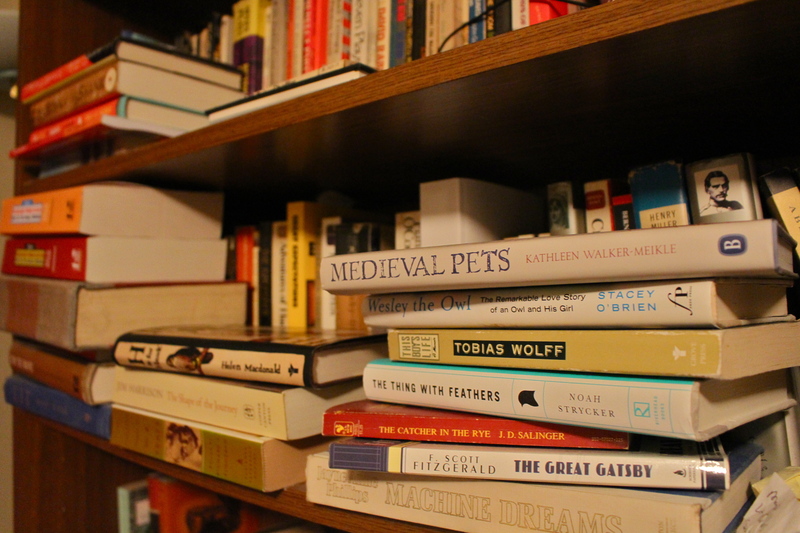 A popular debate is whether or not they’re a good thing, but it’s common knowledge that change is the only constant. 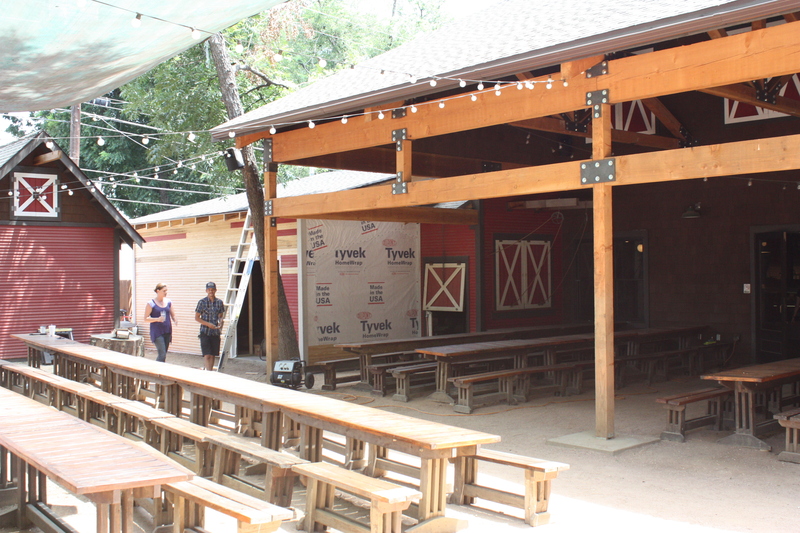 One thing’s for sure--Rainey Street is growing. 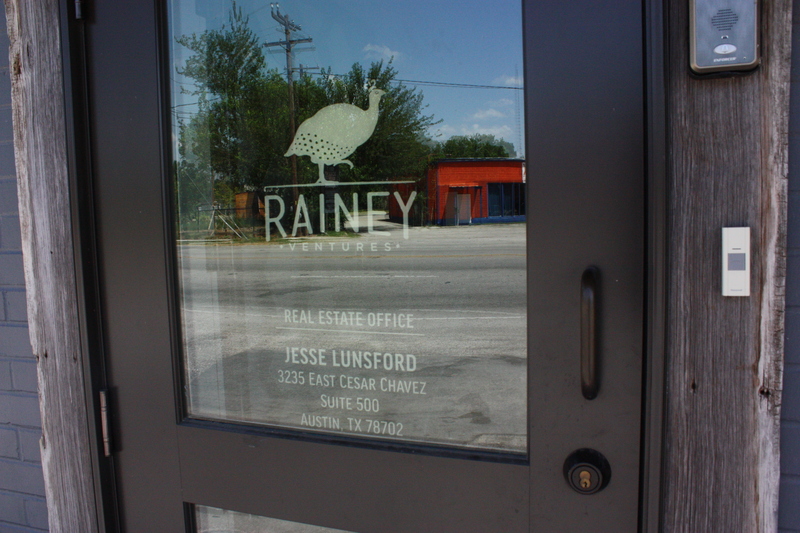 Rainey Street real estate is such a lucrative market that Jesse Lunsford, co-founder of Rainey Street Ventures, has made an entire business out of it. 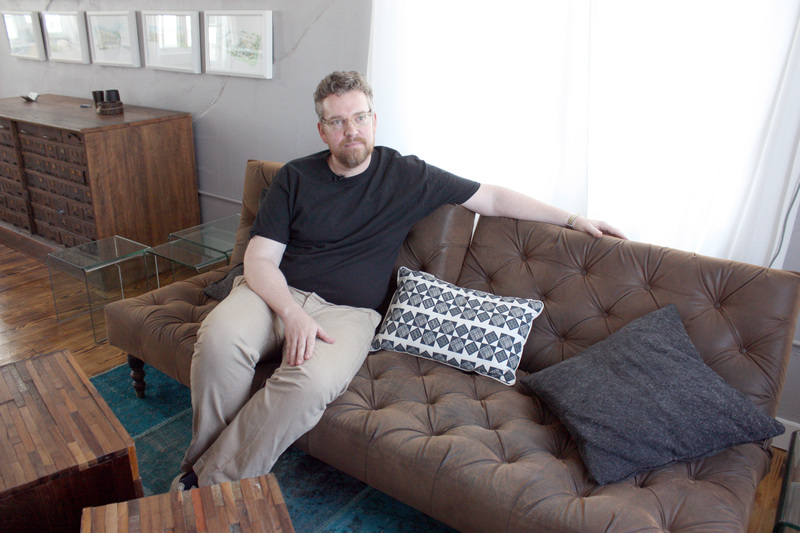 Rainey Street real estate aficionado Jesse Lunsford lounges in his plush office perched atop Jacoby’s restaurant in East Austin, one of his properties. 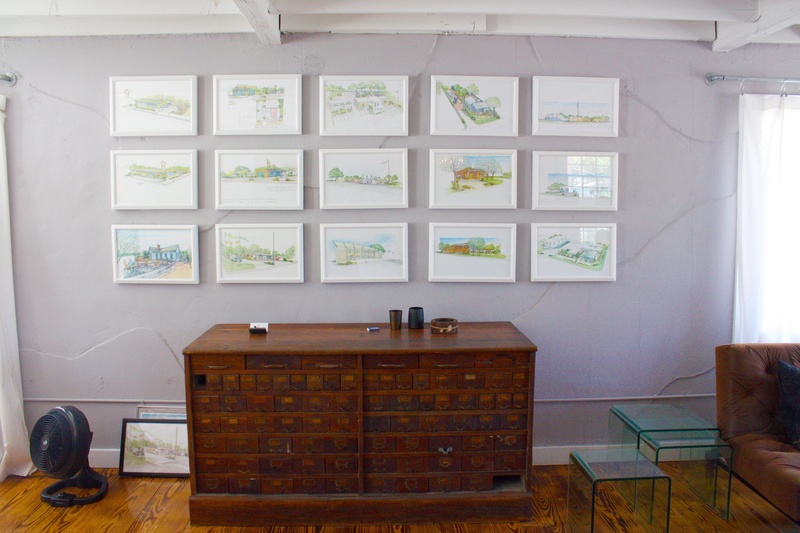 Displayed in Lunsford’s office are colorful sketches of all of his properties. 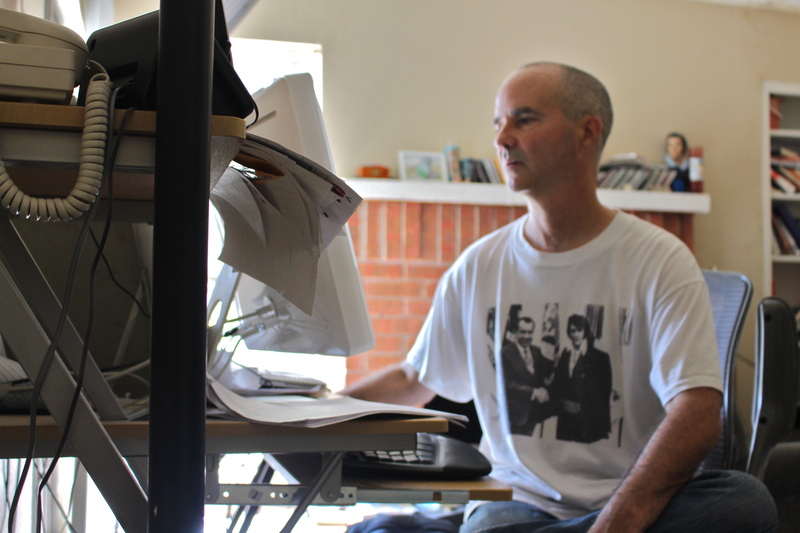 His repertoire includes Craft Pride, Banger’s and G’Raj Mahal on Rainey Street, Jacoby’s, Flocasts and upcoming Lustre Pearl East in the Red Bluff District and Consuela and DWG on Congress Avenue. Lizzie Dupnik has gone from living through the dog days of drawing flyers for imaginary pet care services as a six-year-old to being a full-fledged multi-business owner at age 25. Shaggy Wags Pet Care is Lizzie’s three-year-old pet walking and sitting business but some folks recognize her as someone who offers a sweeter service. 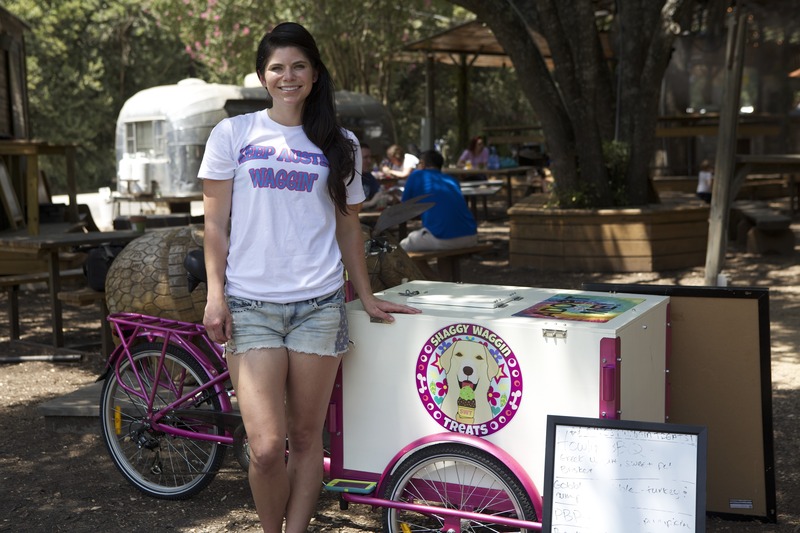 Shaggy Waggin Treats is a one-woman doggie ice cream business. Dupnik is hard to miss when she wheels her hot pink tricycle that pushes her portable freezer on hot summer days. The side of the freezer reads “Shaggy Waggin Treats” circled around a painted face of a golden retriever licking a bright green ice cream cone. Lizzie Dupnik, owner of Shaggy Waggin Treats, started her business in the summer of 2014. Her treats include doggie ice cream, ice cream pupwiches and pupsicles. Lizzie writes the day’s menu on a white board she leans against her portable shop. In addition to five flavors of ice cream, Lizzie offers four flavors of pupsicles and five flavors of ice cream pupwiches. The most popular flavor among pup owners is a combination of peanut butter, bacon and pumpkin that even she says she finds delicious. Lizzie offers low-fat, paleo, vegan and gluten-free among other indulgent options and educates herself on what human-grade ingredients are best for her furry little customers. Lizzie prepares a fresh batch of ice cream for a day of sales at an event. 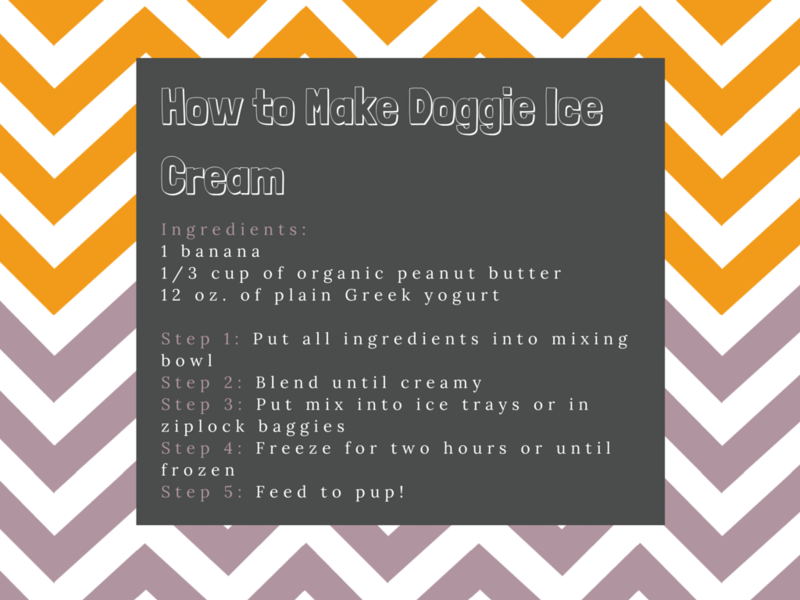 Her doggie ice cream comes in two sizes, two-ounce cups and pint sizes, sold in the pet stores Lofty Dog and Great Out Dogs. Her retailers also recognize the value of the niche doggie ice cream market. Lizzie distributes pint-sized options available for $13 at Lofty Dog, Healthy Pet, Bow Wow Bones Food Truck, Sit Means Sit, DogHouse Drinkery and Great OutDogs. Even restaurant and bar chain Opal’s Divine will soon begin carrying her products in all of their locations. 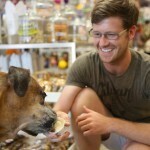 Owner of Great Out Dogs Matt Edwards gives his dog Nugget some Shaggy Waggin ice cream, of which he’s a huge fan. “Once they get a taste, they will remember the container that delicious taste came from and will get just as excited as the first time they had it”. 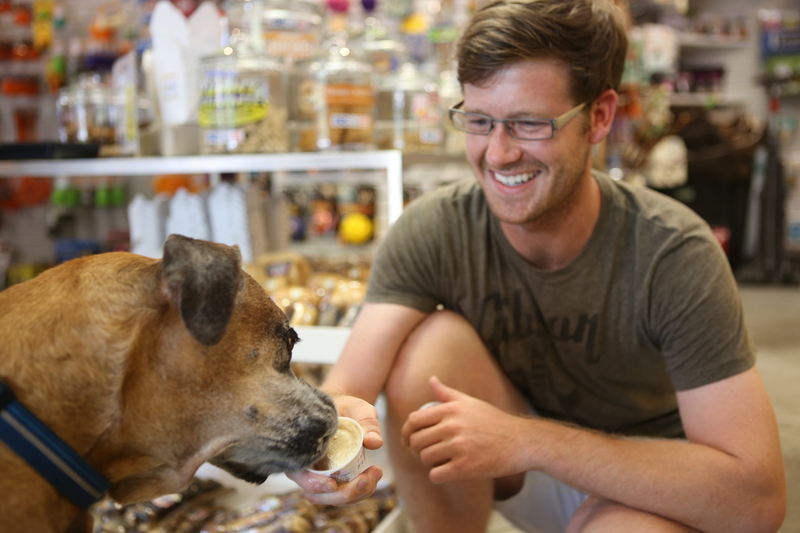 While Shaggy Waggin Treats does well to rely on pet product retailers, it’s the combination between that and selling at city events that sustains the business. 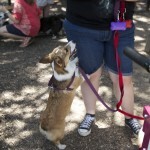 Lizzie scours the Internet for both dog and ice cream events to attend, such as the annual Austin Ice Cream Festival or corgi meet ups organized by the Austin Corgi Pet Lovers. On average, she attends an event every one to two weeks. 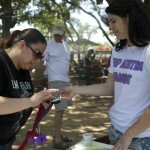 At the end of the day, Lizzie donates a portion of each sell she makes to Austin Dog Rescue. She also advertises a foster dog on her tricycle every time she goes out to find it, what she calls, a “furever” home. 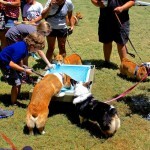 Corgi meet-up attendees play and cool off in the dog water pool at Moontower Saloon. 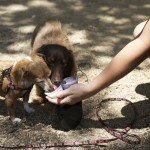 The special event was a success with kids and dogs enjoying each others’ company on a hot summer day. One four-legged attendee anticipates a purchased frozen treat from its owner. 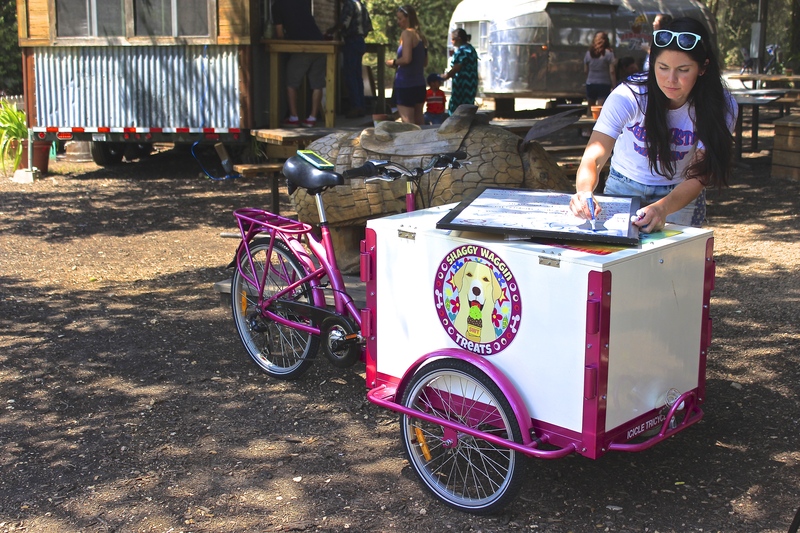 Shaggy Waggin Treats finds local dog events online to attend and sell its ice cream. Display dogs rest outside of the Great OutDogs store. The stuffed animals were originally purchased to display pet merchandise but owner Matt Edwards said “they were such a big hit that [he] put them on the roof and all over the place cause they’re so lifelike”. A customer signs her name on Lizzie’s cell phone after buying some doggie ice cream. Lizzie’s mobile business makes it easy to purchase products on the spot with a card reader for digital transactions. 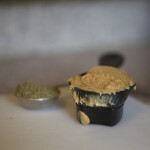 Lizzie Dupnik measures out hemp powder and peanut butter for a batch of Happy Hippy Doggy flavor ice cream. All the ingredients used are natural and have a range of vegan, gluten-free and dairy-free options for pups. 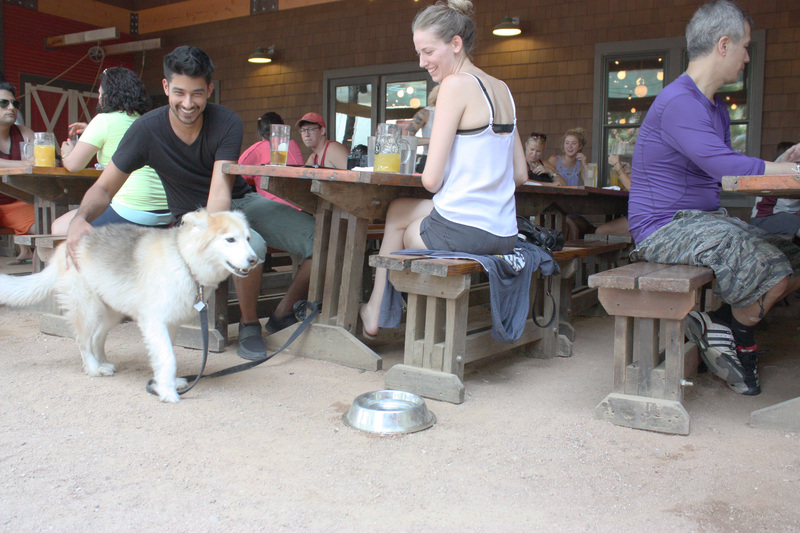 Dog water bowls are scattered all throughout the Moontower Saloon outdoor venue to cool down its furry friends that accompany its customers. They are located at 10212 Manchaca Road and is open 11:00 a.m. to 2:00 a.m. everyday and noon to 2:00 a.m. on Sundays. Wookie (left) and Franky Sinatra (right) taste doggie ice cream for the first time. They both favored the Happy Hippie Doggy flavor, which has bananas, peanut butter and hemp seeds.